Long ago I gave up looking for an untouristy, half-timbered medieval German town, but recently, I stumbled upon it in the sleepy town of Erfurt. The capital of the German region of Thuringia, Erfurt has history swinging from its eaves. It's most notable as the place where Martin Luther studied and became a monk, essentially planting the roots that set into motion the Protestant Reformation. It's also the rare city in the center of Germany that emerged relatively unscathed from World War II, after which it became stuck in the strange cocoon of East German communism for half a century. Because of this, Erfurt has a surprising time-capsule quality. I arrived in Erfurt by train. After spending the previous week in Hard Rock Cafe Munich, Climb Every Mountain Salzburg, and Boys' Choir Vienna, I was excited to be in a city that was unfamiliar. I hopped in a taxi to my guesthouse, run by the monastery Martin Luther called home. A tiny wooden cross decorated the otherwise blank wall above my headboard. The inlaid tiles and creaky floor felt like pre-WWII Germany. Pushing out my shutters, I leaned out my window to survey the scene -- a thick deciduous forest, chirping and hooting birds, a babbling brook, and a well-groomed lane with locals who seemed as happy to be in Erfurt as I was. To orient myself, I took a walk through the city, starting in the main shopping square called Anger. Meaning "Meadow," the name evokes the grazing land that once sprawled just outside the city walls. Famished, I dropped by a characteristic bratwurst stand to buy a Thuringer brat, a long, skinny pork sausage. The man paused until I realized I was supposed to pick up and spread open my roll so he could place the sausage in it. I beaded it with hearty mustard and then snuck in a little ketchup (a tourist move, I admit). Purists put only the locally made Born brand mustard on their brat. Munching the sausage, I strolled down to the river. Erfurt is named for a shallow point where ancient traders could ford (-furt) a river. The Er- comes from an old German word for dirty -- the water was muddied when people would cross. As I explored, it started sinking in: I wasn't in quaint, beer-and-pretzel Bavaria anymore. Erfurt has that old Tupperware aura of East Germany. People seemed more hardscrabble, less exposed to the world. English was suddenly very foreign. I hadn't heard an American voice all day. Despite being very popular among German tourists and Martin Luther pilgrims, Erfurt remains largely undiscovered by American visitors. I walked across the Merchants' Bridge that spans the river. Unlike the famous shop-lined Ponte Vecchio in Florence, people actually make their homes along this bridge. As in ages past, the residents live upstairs and run shops downstairs, such as at Theatrum Mundi, featuring the brilliant work of puppetmaker Martin Gobsch. For 1 euro, I saw an intricately detailed, fully articulated rendering of Snow White. Across the bridge is the Old Synagogue, one of Europe's earliest surviving synagogues. Its cellar features the Erfurt Treasure, consisting of 60 pounds of gold, silver, and jewels that once belonged to a wealthy local Jew. The prize piece is a finely detailed golden wedding ring from the early 14th century, inscribed with the words mazel tov, indicating that it once belonged to a Jewish woman. From the synagogue, I took a short walk to the Preachers' Church, Erfurt's main Protestant church. Despite being rebuilt after World War II, it still features the original 700-year-old wood wall used in pre-Reformation days to separate people from the clergy. Behind the altar is a kaleidoscope of colorful windows, pieced together from the original medieval glass windows shattered in the war. The church also has a glorious circa-1650 Baroque pipe organ that is used for weekly concerts. My walk through Erfurt culminated on the vast Cathedral Square, dominated by twin churches -- the Church of St. Severus and the cathedral where Martin Luther was ordained a priest. As I soaked up the scene, I was enveloped by the sounds of an opera troupe rehearsing on the square while the dark churches rung with the sound of pipe organists practicing. For me, as a Lutheran, coming to Erfurt is a bit like a Catholic going to Rome. Without the pivotal accomplishments of the Reformation, the Bible would still be read in Latin and interpreted for us by priests. The 500th anniversary of Martin Luther kicking off the Reformation in 1517 is quickly approaching, and towns like Erfurt will enjoy lots of attention. But until then, visitors can enjoy this delightful slice of simple, unspoiled Germany in peace. The Evangelisches Augustinerkloster, Martin Luther's monastery, rents 51 simple rooms right on the monastery grounds (moderate, www.augustinerkloster.de). Pension Rad-Hof, next to the monastery, isn't fancy but feels homey (budget, www.rad-hof.de). Zum Guldenen Rade ("At the Golden Wheel") offers classic German and Thuringian cuisine in an appealing beer garden out back (Marktstrasse 50, tel. 0361/561-3506). Feuerkugel serves up good, traditional Thuringian cooking from "Oma Kathe" -- Granny Katie (Michaelisstrasse 3-4, tel. 0361/789-1256). Erfurt has a straightforward tram network, though it's unlikely you'll need it in this walkable town. 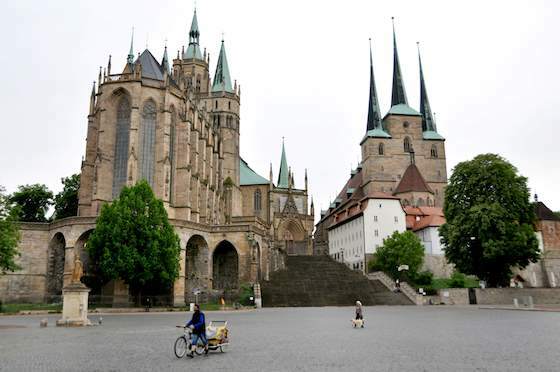 Vacations & Travel "Germany's Undiscovered Erfurt"